Gibson Guitars is looking deep into its 125-year history of shaping sound across genres and generations to inspire the company's future direction. 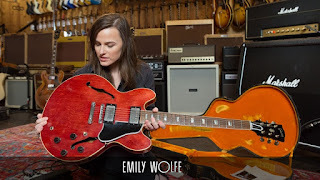 Hear rising artist Emily Wolfe play Eric Clapton’s 1964 Gibson ES-335 "Crossroads" guitar (famously used during Clapton's years with Cream) and talk about how tradition inspires her. Gibson CMO Cesar Gueikian shares how iconic models from their golden era— as well as new models informed by artist testing— will be at the center of their pursuits; ensuring that the Gibson brand will continue to make the most beautiful, relevant instruments for years to come.